Yes, there is such a thing. If you’re looking to serve a pasta dish to kick off the holiday this year— make my Baked Ziti. Your guests will love it. My tip: prepare and bake ahead of time. I am all about taking the stress out of the kitchen and this recipe does just that. Now add the balance of the ricotta cheese, Romano cheese, shredded mozzarella cheese, and sauce to a large bowl and stir this all together. Cook your ziti half way of the recommended time. Bake in a pre heated 350 degree oven for 30-45 minutes! You’ll see the sides bubbling then remove it. Note: draining the Ricotta is critical in making a non watery ziti. Empty the ricotta into a strainer lined with cheese cloth and place the strainer over a large bowl. Cover the top with plastic wrap and allow this to drain for 24 hours in the fridge. Press any remaining liquid out of the ricotta. 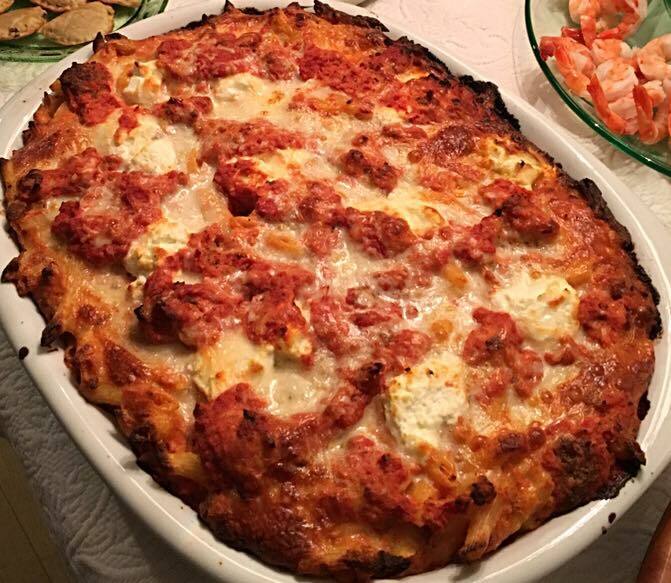 For a very festive baked ziti top with sliced Mama Mancini’s meatballs.